Editor starts a layout inspired by the Fairweather Railway and considers the potential of this concept along the way. The Editor recalls a very neat French station suitable for modelling. Giles Barnabe's latest layout, in On30, is a clever freelance 'fantasy' operation located in the Caribbean and packed with character. Bob Mason tries a German or Italian 'Mouse Hole' on the smaller baseboard. 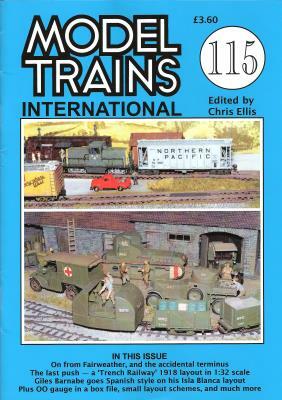 Well detailed British Army 'Trench Railway' depicted in realistic style by Ian Roberts. A very small OO gauge layout that fits inside a standard box file, built and described by Steve Grantham. Giles Barnabe suggests a selection of simple but interesting small layout ideas from his files. How to get going, and some buying ideas for those starting out. Peter Marriott describes the structures and ideas behind his pleasing portable layout.